NASA's Juno spacecraft has sent data confirming that it performed the eighth science flyby over Jupiter's mysterious cloud tops on 24 October, the US space agency said in a statement on Friday. Juno was launched on 5 August, 2011, from Cape Canaveral in Florida and arrived in orbit around Jupiter on 4 July, 2016. Due to solar conjunction on Jupiter, the confirmation was delayed by several days and data returned only on 31 October. Solar conjunction is the period when the path of communication between Earth and Jupiter comes into close proximity with the Sun. During this period, no new instructions are sent or received from Juno, as it can corrupt the information due to interference from charged particles from the Sun. Instead, a transmission moratorium is put in place, engineers send instructions prior to the start of solar conjunction and store data on board for transmission back to Earth following the event. "All the science collected during the flyby was carried in Juno's memory until yesterday (31 October), when Jupiter came out of solar conjunction," Ed Hirst, Juno project manager at NASA's Jet Propulsion Laboratory in California, said in a statement. "All science instruments and the spacecraft's JunoCam were operating, and the new data are now being transmitted to Earth and being delivered into the hands of our science team," Hirst added. 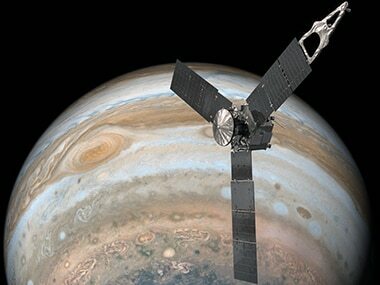 Juno's next close flyby of Jupiter will occur on 16 December. "There is no more exciting place to be than in orbit around Jupiter...our spacecraft is in great shape, and the team is looking forward to many more flybys of the solar system's largest planet," Hirst said. During its mission of exploration, Juno soars low over the planet's cloud tops -- as close as about 2,100 miles (3,400 km). During these flybys, Juno is probing beneath the obscuring cloud cover of Jupiter and studying its auroras to learn more about the planet's origins, structure, atmosphere and magnetosphere.